KETODIN CREAM – ketoconazole for the treatment of fungal skin infections (athlete’s foot, candidiasis of skin folds, Candida Groin) at an affordable1 price. Composition: ketoconazole 20 mg / 1 g and other excipients. Ketoconazole is an imidazole dioxolane derivative. It exhibits fungicidal and fungistatic effect against dermatophytes and yeasts (Candida, Pityrosporum, Torulopsis, Cryptococcus), dimorphic fungi and higher fungi (Eumycetes), Aspergillus spp., Sporothrix schenckii, some Dermatiaceae, Mucor spp. helps reduce skin peeling and itching. Indications for use: treatment of skin infections caused by dermatophytes and yeast-like fungi sensitive to the product (candidiasis of skin folds, inguinal epidermophytosis, athlete’s foot). Hypersensitivity to ketoconazole and/or any other formulation components. Ketodin cream should be applied directly to the affected skin and surrounding areas. For the treatment of athlete’s foot Ketodin cream should be applied directly to the affected skin and surrounding areas twice a day. The course of treatment should last 1 week. In severe cases, continue therapy for 2–3 days after all symptoms have disappeared to prevent recurrence. For the treatment of candidiasis of skin folds and epidermophytosis inguinalis Ketodin cream should be applied directly to the affected skin and surrounding areas twice a day. The course of treatment should last for a sufficient period of time at least for 2–3 days after all symptoms have disappeared to prevent recurrence. If necessary, a therapeutic course may be extended to 6 weeks. For detailed information on the medicinal product Ketodin, please see “Package leaflet” page. 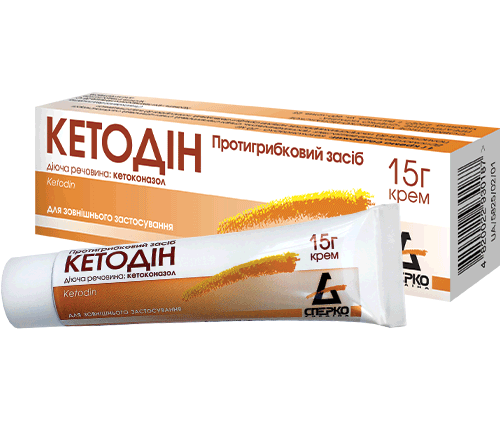 Ketodin cream, MA of the MoH of Ukraine UA/5825/02/01 dated 09.04.13. 1 Shall be understood to mean an average retail price for Ketodin cream – 67,18 UAH as of October 2017, based on the data of Proxima Research LLC.